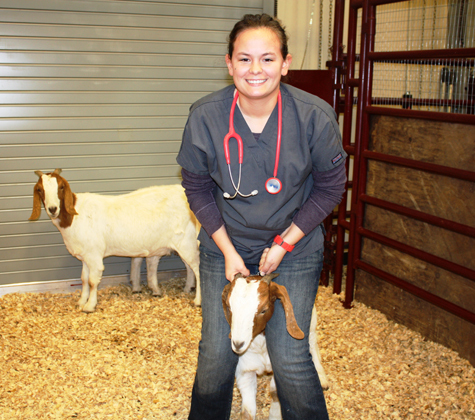 OSU-Oklahoma City veterinary technology students recently hosted a herd of goats in the Agriculture Resource Center’s large animal clinic. Students performed routine tests on the animals. Pictured is veterinary technology student Robyn Gregory with her patient. Officials from the Bureau of Indian Affairs (BIA) visited the campus of Northeastern Oklahoma A&M College, (NEO) Wednesday, Dec. 21, 2011, to discuss the exploration of criminal justice education for Native NEO students. 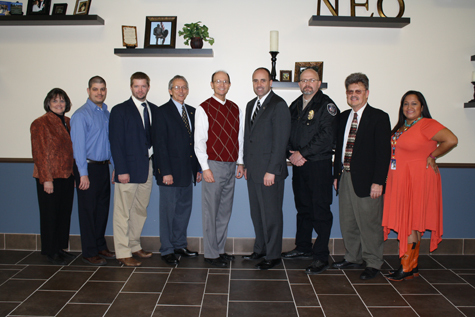 From left to right: Gloria Steed, reporting officer for Miami Tribe; Brad Black, Wyandotte Nation police officer; Brad Henderson, Title III project firector; Chief Thomas Gamble of the Miami Tribe; NEO A&M College President Jeff Hale; Darren Cruzan, BIA chief law enforcement officer; Troy Fugate, Miami police officer and NEO criminal justice instructor; NEO Police Chief Tom Robertson; and Claudia Little Axe, AICE cultural specialist. 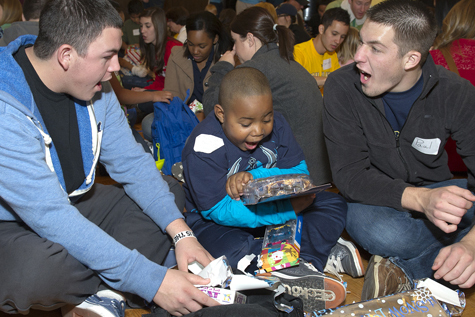 The University of Central Oklahoma spread the joy of the holiday season with its 20th annual President’s Club Children’s Christmas Party, benefiting more than 200 elementary students from nine Edmond schools. More than 500 Central sponsors accompanied the children at the party where they received gifts and backpacks and participated in crafts and meet-and-greet with Santa.